Take the Hinksey exit onto the A423. Henley / Reading road and turn left at the roundabout onto the A4144 Abingdon Road. Turn right at the second main traffic lights onto Donnington Bridge Road. Turn left at the lights / T junction onto Iffley Road. Daubeny Road is the second turning on the left after the Pelican Crossing. The Convent main entrance with car parking is opposite the T junction between Daubeny Road and Warwick Street / Parker Street. Follow the A4121 South until you reach the Littlemore Roundabout. Turn right through the sets of traffic lights onto the A4158 Iffley Road. Continue along the Iffley Road and keep to the right hand lane at the traffic lights adjoining the Donnington Bridge Road junction. Continue through the lights turning left into Daubeny Road as above. 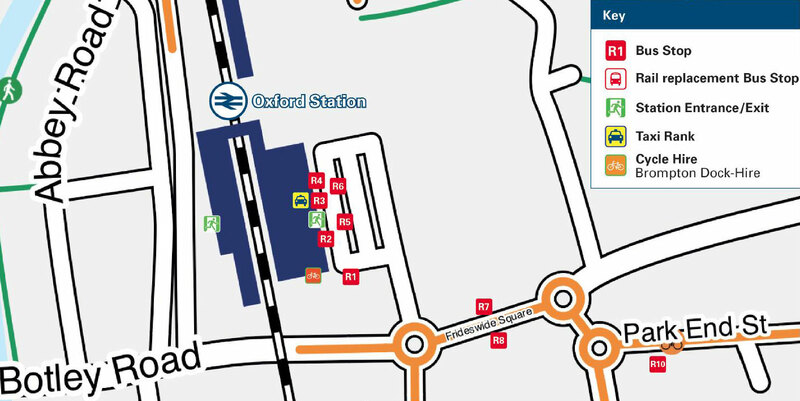 There are frequent buses from London (Oxford Express or Oxford Tube), Heathrow (Airline) and Gatwick (Airline) to Oxford. All stop at St Clement’s. It is a walk of approximately twenty minutes from St Clement’s along the Iffley Road to the Convent. 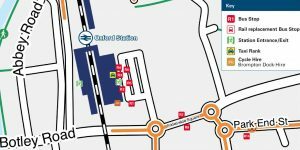 There is presently no direct bus to the convent from the Oxford Railway Station. Oxford Bus Company/Stagecoach Bus 3 or 3A at stop E1, T2 or K2 will take you to us. See more instructions under No. 3 / 3A Bus. Oxford Bus Company/Stagecoach Bus 3 or 3A will take you to us. Bus 3/ 3A operates from Stops E1, T2 and K2. 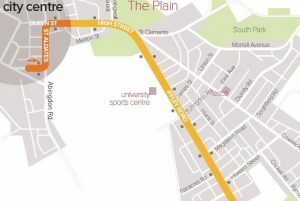 Please see City Centre Bus Stops Map here. To see the bus stops along Iffley Road, please click here. Alight from the bus at the Magdalen Arms stop along Iffley Road. Walk a few yards and cross to the opposite side of the road at the pedestrian crossing. Walk down Daubeny Road. The Convent is straight across the end of Daubeny Road. Enter the car park and front entrance of the Convent. Ring the bell at the main door by the fishpond. A Sister will come to answer the door as soon as possible.